Picking a modem/router combo isn’t tough. Figure out how much bandwidth you need to move, think about your budget, and reflect on compatibility with the rest of your system. That’s really all you need to do. And keeping those guidelines in mind is one of the only things that can stop you from choosing the wrong equipment. The Nighthawk series is mostly future-proofed hardware with exceptionally strong ease of use. Though some of their equipment is intended for network experts, the CM1150V Nighthawk Cable Modem was made more for people who don’t know what they’re doing. Still, there are deep customization options available for more advanced users. But it’s the smooth setup and maintenance that really draws people to something like the CM1150V. From a superficial perspective, this modem/router is well suited to serving medium-sized environments. 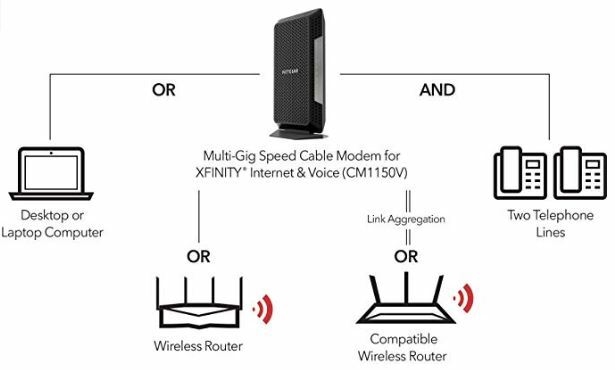 It was made to deliver gigabit speeds alongside the best call clarity you can expect from the XFINITY network. And as a distinguishing part of that support, it provides a pair of phone line ports for people who need to retain Comcast’s voice services. The CM1150V isn’t going to be the right solution for everyone. But for networking novices who are looking for a simple and quick way to connect to the internet, the CM1150V has plenty to offer. Standing upright, the CM1150V measures 6.1 x 10.3 x 3.4-inches. It would look like a terribly ordinary modem, except it’s been covered with a number of texturized holes. Some of these indentations are purely decorative, but many of them serve to provide better airflow for the equipment. Modems can run a little hot, routers can run a little hot. When you combine the two, things get hotter. Rather than being square, this modem actually has the shape of an elongated hexagon. Each end of the device leads to a point, which doesn’t really provide any significant advantages to your connectivity, but it does look pretty neat. Though without the stand, you’ll find it impossible to keep it upright. It might seem trivial, but the upright position is actually the best way to use and store this equipment. If it’s laid flat against a table, you’ll drastically reduce airflow to the device. Routers can run a little warm, and modems can run a little warm. When you combine both into one thing, it really helps to maintain your airflow. Apart from the neat aesthetic, you’ll notice the front side of this modem features a long row of high-contrast LED icons. Most of these can be identified without the use of the user manual, but if you encounter some kind of network issue, these icons can be pretty instructive. Turning to the backside of the Nighthawk CM1150V, you’ll find a four Ethernet ports, two phone jacks, and a cable connection. There’s also the DC power port, the power button, and a reset button which was hidden away within the chassis of the modem. The CM1150V is a DOCSIS 3.1 device. That allows you to access the fastest speeds available, and makes your gear ready for the next generation of speed upgrades. It also means you get speeds which are ten times faster than DOCSIS 3.0 standards. And 3.1 happens to be backwards compatible with 3.0 equipment so you don’t have to worry about compatibility issues cropping up. Supporting 32 downstream and 8 upstream channels, the router portion of the Netgear CM1150V is suitable for providing two gigabits of throughput. If you actually want to use two gigabits of bandwidth for a single connection, then you’ll need to use a Link Aggregation Group, which is supported. But a ceiling of 2 Gbps is high enough for essentially anyone who’s not trying to setup a library, or some kind of internet café. One thing this equipment cannot provide are network expanding features, like MU-MIMO support, or native mesh support. Many people won’t find that to be a problem. After all, MU-MIMO is pretty cool technology, but it’s totally dependent on the 5GHz band. That puts some pretty hard-and-fast limitations on who can use those features. Because your devices need line of sight with the CM1150V to access the 5 GHz band and all those extra features. Consequently, equipment like the CM1150V probably isn’t the right router/modem combo for someone who’s working on creating an expansive smart-home. When you have 15 different devices connected to your Wi-Fi network, you’re going to want networking features made specifically to support that level of connectivity. The CM1150V is better suited to about a dozen concurrent connections. You’ll find the network latency can become slightly sluggish if you really start pushing beyond that point. 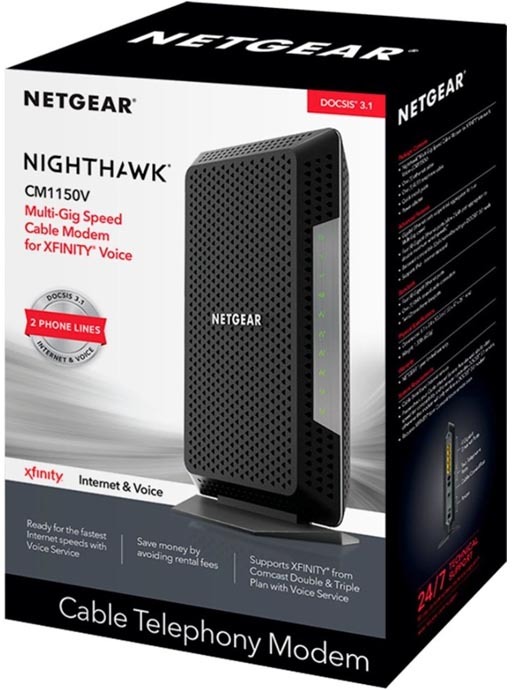 The Nighthawk Multi-Gig Speed Cable Modem was made specifically for Comcast, and consequently it will self-activate for people who are using XFINITY. Most people using their own cable modem have to call Comcast and go through an installation procedure to register their equipment. Being able to skip that step is quite convenient, especially if you’re trying to do an installation outside of Comcast’s support hours. The CM1150V comes with a pair of telephone ports, which can be used to prioritize voice control services. That includes 3-way conference calls, call forwarding, basic caller ID, and similar features. The presence of those ports is certain to be a distinguishing feature for this device, because without them, you’re unable to access any of Comcast’s voice features. For a lot of people, that’s just not acceptable, especially when it comes to essentials like caller ID. It makes sense that Netgear made the CM1150V Nighthawk into a single unit, but this is actually two separate devices crammed into one. It’s a router and modem combined. For most people, picking up equipment like the CM1150V makes sense, especially when it supports forward-looking standards like DOCSIS 3.1. But from the perspective of enthusiasts who are looking to min/max their network performance, it usually makes sense to get your router separately from your modem. There are generally two reasons why. The first reason is because if one component of a modem/router combo breaks, you lose two pieces of equipment. The second reason has to do with planning for the future. In the past, it really made a lot of sense to choose entry-level networking equipment. Because better performing technologies were constantly coming down the pipe, and it seemed like Wi-Fi was improving every two or three years. But the Nighthawk CM1150V provides support for DOCSIS 3.1, which gives it a forward-looking design, ensuring an ability to serve just as well in the future as it does presently. So the second reason isn’t very damning of the CM1150V, either. For protecting your network, most of the heavy lifting occurs in the gateway between your network and your connection. In other words, your router is really doing most of it, so you don’t have to look to the modem portion of this device to monitor security. Fortunately, Netgear is no slouch when it comes to security features. The entire Nighthawk line of routers provides automatic firmware updates, ensuring you get the latest protections for your network as they’re available. How many people sit around thinking about the last time they updated the software on their router? Even for people who use the internet all day long, that kind of thought just doesn’t occur to us. Automatic updates can be an enormous aid to your network. These protections also ensure every device on your network is covered, even devices that don’t have their own independent antivirus protection software. For example, DSLR cameras and game console devices. That’s not to say Netgear’s protections can be used in place of all other security measures, but they do add another layer of protection. Netgear also delivers when it comes to more common sense security features, like home network management. You can establish a variety of different user profiles, and use them to determine who’s allowed to do what. Can your guests download large files? Can they visit video streaming websites? Whether you’re trying to protect your kids, or you’re just making it easier to avoid using social media sites during the middle of the day, these security features can be put to a variety of different purposes. It’s becoming increasingly common knowledge that people can save money by owning their own modem. Compared to renting from an internet service provider, you can easily save hundreds over the course of only a year or two. That really makes it easier to contextualize the cost of the CM1150V. 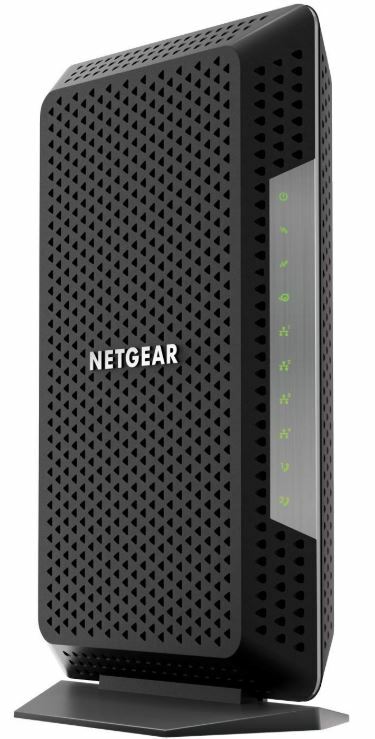 Netgear includes a one-year warranty. That’s a little underwhelming. Not because the warranty will be inadequate, but because equipment in this price range often does better. Though as a counterbalance, it’s worth noting that Netgear has great tech support. You also get 3-months of tech support. After that, you’ll be reliant on their web services to solve any issues that crop up. The Netgear CM1150V Nighthawk was really made for three reasons. Internet service providers are currently working on extending gigabit-style connections across the nation. For people who are currently able to take advantage of those speeds, equipment like this is necessary. For anyone who wants to be able to take advantage of greater speeds when they’re available, DOCSIS 3.1 provides room for growth. If you’re not a Comcast customer, this router/modem combo wouldn’t make any sense. You can’t use this equipment for DSL or satellite connections, and you’d have a tough time using the router component separate from the modem component. It also doesn’t make much sense for people who don’t need the old phone ports because the cost of supporting voice features is present in the price tag. Using two WAN ports means you’re able to take advantage of multi-gig speeds. And of course, compared to renting a modem, the CM1150V is incomparably superior. If you happen to be a Comcast customer, and you care about support for voice services, it’s worth carefully considering the CM1150V.